Admin Note: I move the posts in relation to the 400-4V discussion from my engine build thread to here. We went a little off topic from the original post, but this is all great discussion worthy of it's own thread. Allegedly, there were 400-4v engines planned/maybe produced for Commiefornia emissions. never seen one. Might be like the 72 Thunderbirds with a 400, everyone said Bigfoot had the only one. "It's amazing how many people are still convinced that Ford made a factory 400-4V. I just located this photo from a google search. It was a Ford LTD with a 400. You can see the Edelbrock intake on this car." Ford had actually started pre-production of a 400 4V intake and listed a 400 4V as an optional engine for California Emissions in some of their brochures. The 400 4V sticker is probably aftermarket, though. i'd have to assume that the air cleaners had a 400-4V decal on them? Rock, you're the expert, so you probably know more but it was my understanding that that 4-bbl intake was an "experimental part." While yes it was obviously produced, I meant it didn't go on any regular production cars. The pic I posted is the same intake that you posted pics of. I always thought that this was just a one off experimental part that ended up in someone's car. I didn't know there were others?? FWIW, I did check the Ford Master Parts catalog and there is no listing for that part number. The only listing is for the 2-bbl intake. No special intakes for the 400, for police use either. It was time for birthday cake and candles as the Ford Motor Company turned 75. Ford had been building trucks for more than 60 years. In honor of the diamond jubilee, a limited number of Ranchero Shelby GT's were created in Shelby's workshops located on west 10 mile road in Southfield, Michigan. These magnificent thoroughbreds were finished in black with twin gold pinstripes that highlighted the stunning body in a most unusual way. The grille was black except for the grille surround and the trademark Shelby snake replaced the Ranchero grille medallion as part and parcel of the Shelby identification package. Each carried a special tag above the brake booster, "Built by Shelby Automotive, based on the Ford Ranchero". The word "Ranchero" was etched into the metal tag. As might be expected, the Shelby Rancheros were lighting fast. Each was given the muscle bound 400-cubic inch V-8 with a 4 barrel carburetor set up. There were goodies like Cobra valve covers, a special Cobra starter and many other items straight from the race team's parts bins. Plus a performance dual exhaust package, a 735 cfm Holley carb, an engine appearence package. heavy-duty battery, a pursuit lighting package (which included a set of giant fog lights), a performance handling package, and a special white-on-black speedometer that reached 120 miles per hour at a time when 55 was the speed limit. These vehicles were exempt from emissions controls. Lest anyone should forget that little fact, the emissions spec sheet in the glove box was stamped "VOID". A specially crafted suspension permitted these fire-breathing Rancheros to sit unusually low to the ground. The racy truck was given 15X7 chrome Magnum 500 wheels with Shelby centers. All Shelby GT Rancheros were shod with raised white outline letter tires. Interiors of Shelby Rancheros were finished in white vinyl. Seats were comfort Lounge split bench seats with a center armrest. Full, white Thunderbird door panels graced the interior. Dove gray was the accent color throughout the cabin, a color never used by another Ford product for that purpose. Black leather wrap was used on the Shelby steering wheel. The configuration of the steering wheel precluded Cruise control on these Shelby GT Rancheros but it is doughtful that owners cared. A power radio antenna was part of the package. Publicly announced that 75 of the Shelby Rancheros were to be built, one for each year that Ford had been in business. Select customers were invited to purchase the trucks, sight unseen, knowing only the specs. To date, a total of 39 GT Shelby Rancheros have been verified by VIN numbers. I was in charge of car ordering in a ford dealership. 1977 ford offered a 400 4v, for the 1977 smaller tbirds.due to federal epa tests,they failed and never were sold to public. 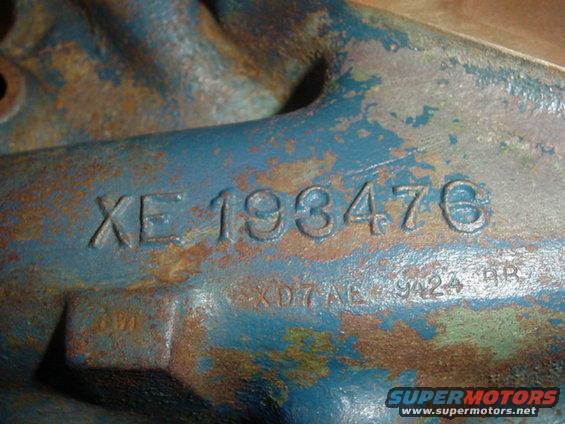 thy manifolds produced put into old road parts with a x stamping on manifold. That's great info and supports what Randy said earlier. Does anyone have any documentation about this engine? Would be neat to see. As I said, the Ford Parts Catalog has nothing about this intake. Failing the EPA tests kind of goes along with the Shelby Rancheros using this setup, since the claim was they did not have to be EPA compliant. The 400 4V engine option is listed several times in the September 1976 ford and mercury car dealer sales brochures, that advertised the new 1977 car models for sale. It does not state that this Engine was only available in California. It appears that this engine option might have been available in all fifty states of the U.S. It was also listed several times in the September 1976 edition of motor trend magazine, that advertised the new 1977 ford and mercury cars for sale. It shows this 400 4V engine as an available option for the 1977 thunderbirds, LTD's and mercury marquis's. 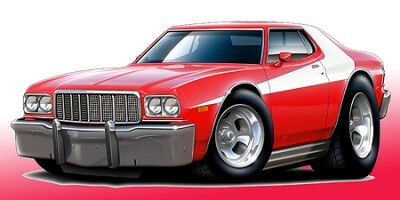 It says it was the standard and only engine available for the 1977 California Mercury Marquis's. 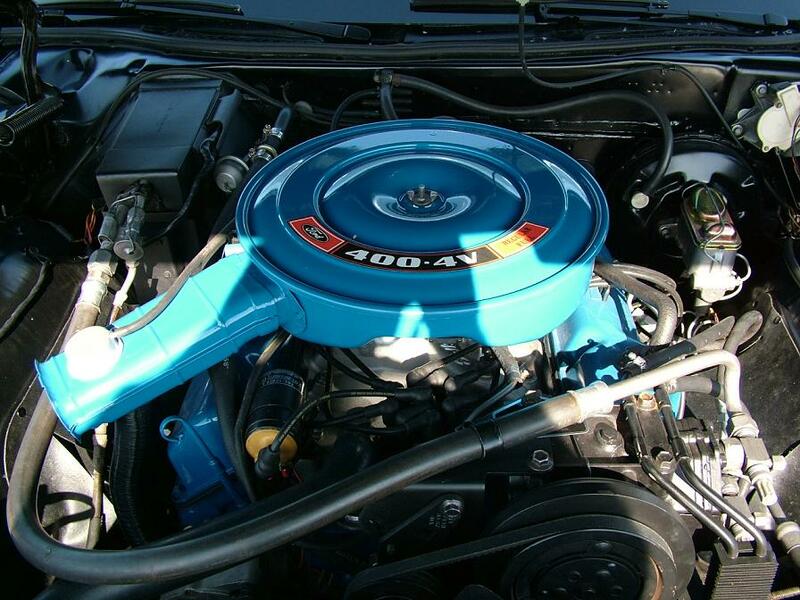 And it was the standard engine available for the 1977 California LTD's. I am not trying to suggest that these 78 Shelby GT Ranchero's do not exist, but there was a discussion about the ranchero book on the Ranchero site, and none of them have ever seen one. 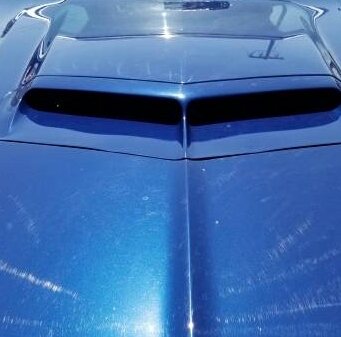 There is a link there for a '78 Shelby Ranchero GT clone tribute car that was for sale on Ebay five and three quarter years ago, but the link is too old to work. This subject was also discussed on a Shelby site eleven years ago and no one answered. The person who asked the question about the 78 Shelby GT Ranchero was also the person who answered the question. The ranchero book claims that the '78 Shelby GT Ranchero used a 735 C.F.M. Holley carburetor, but I have never seen or heard of a 735 CFM Holley carburetor with a Motorcraft 4300D spread bore throttle bore design, such as in the pictures of the 400 4V "X" experimental intake manifold, that was shown on the upper post's of this thread. Maybe ford had used a different square bore throttle bore design intake manifold on the '78 Shelby GT Ranchero's to fit the Holley 735? 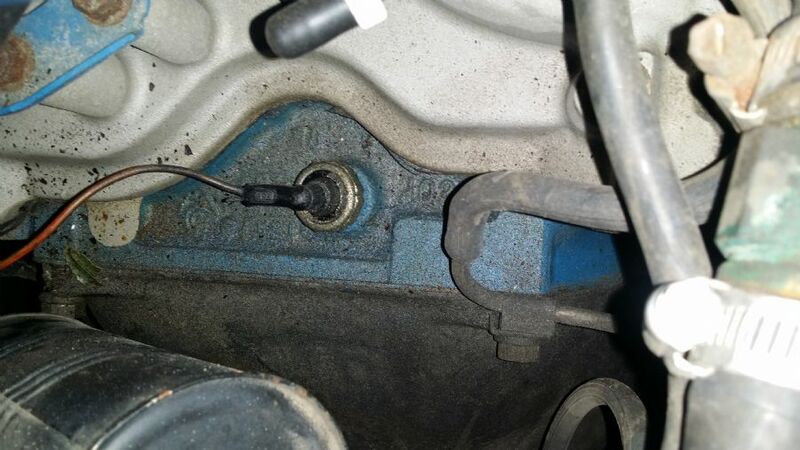 Or maybe they used a special carburetor to intake manifold adapter. 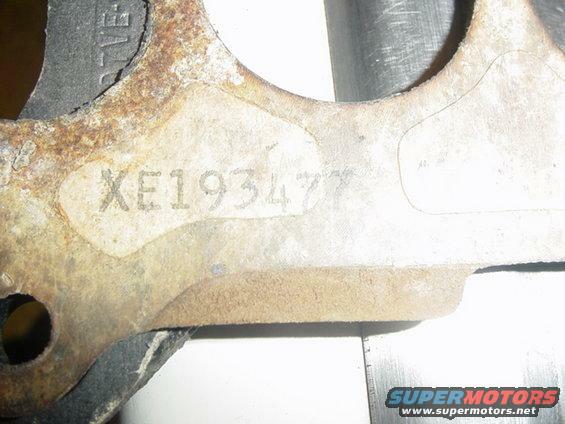 There is a picture below of a motorcraft 4300D spread bore carburetor gasket. There is a picture below of a Holley square bore carburetor gasket that is used with many Holley 735 C.F.M. Carburetors. 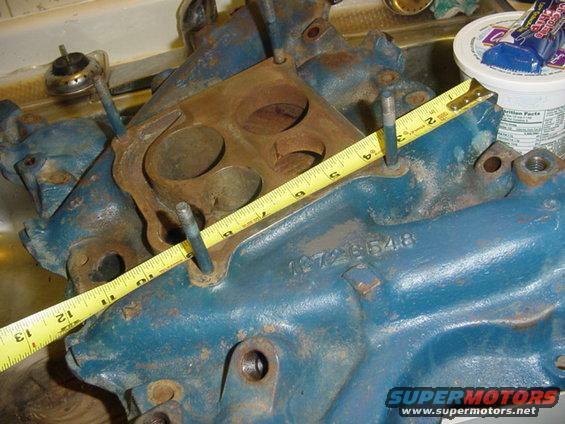 did you know holley made a 3bbl carb? I am not suggesting that these 78 Shelby GT Ranchero's do not exist, but there was a discussion about the ranchero book on the Ranchero site, and none of them have ever seen one. There is a link there for a 78 Shelby clone ranchero for sale on Ebay five and three quarter years ago, but the link is too old to work. Read the teamshelby.com post, and tell me it's not strange this guy seems to answer himself as if it's a different person. So based on everything laid out so far, it seems Ford planned to introduce a 400-4V for 1977 as the top engine option for the T-Bird and as an available option for the full-size cars. It seems they planned to use it to meet the CA emissions. However, as we know this didn't actually happen. My guess is they couldn't get the engine to pass emissions so they abandoned it. However, we do know some of the manifolds definitely made it into field use, but I guess it's not really clear how this happened. I doubt they went on regular production cars, but maybe some engineering test cars/engines made it on the street? Or the intakes were sold off? Who knows. It seems doubtful that they went on the Shelby Rancheros (if they even existed). I worked in Toyota's engine plant in Huntsville, Alabama for a while. Any parts that didn't pass muster or were used for testing went in the scrap metal dumpster in the back. Possible the same thing happened to these intakes, and somebody at the company who picked up their scrap saw a chance to make some cash, rather than have them melted down. Just a thought. Bob Champion’s 351C , The Cleveland 6V intake manifold. According to Tom Vaught, recently retired after 39 years as Ford Motor Company’s Boosted Engine Design Engineer and former Holley Engineer on the design team responsible for the development of the Holley Carburetion for the Cleveland 366 6V intake manifold, this 6V carburetion program came about through Ford’s 366 NASCAR Engine program where they built 500 366ci Cleveland motors with 6V intakes for NASCAR competition, only to have NASCAR disallow their use, causing Ford to physically destroy all the intakes. As apart of the Ford NASCAR 366 Engine program, Tom Vaught of Ford Motor Company (Holley Carburetors then) was a member of the design team that built the Holley 2300 6V carburetors for this special Ford project, using Holley 2300 vacuum secondary 6V carburetors. During the testing, it was determined that the 1350cfm flow of all three carburetors was too much air and fuel for the Ford 366 program so these carburetors were sleeved for the Ford NASCAR 366 Program. After the comprehensive destruction of the 500 original motors, intakes and 1500 Holley carburetors, very few survived. ... When Ford cancelled the Ford 366 NASCAR program, they decided to abandon the Holley 6V carburetors which they had Holley develop for them. Holley then offered them to GM and MOPAR. GM was not interested, but MOPAR was. ... "
The testing of the 400 4v engine, was performed at the Arizona proving grounds in march of 1976.These tests were performed in cars under epa supervision. 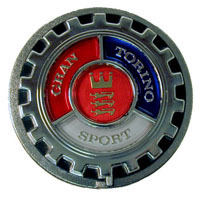 the cars were 1976 torinos and montegoes. The engines were pulled destroyed and the cars were sold for salvage.THE cars were not serialized,not operable on street. Not liking what I see. Casting on this block is not what I had hoped to find as to it's birthplace. Will have to clean it a bit then get the cast numbers from above the starter. In 1978 carroll Shelby,was not with ford.He was only making chile and selling parts. was this a true 4v headed 400, or just a 4v intake on the regular production 400 with 2v heads? 76/77 were supposed to be 2v heads.